Acupuncture is the practice of inserting and stimulating needles in specific points in the foot and ankle or around painful areas in the foot and ankle, and is widely used for chronic pain. Studies have shown acupuncture to be effective in relieving types of foot pain. A study published in the journal Acupuncture in Medicine in 2009 found acupuncture to be effective in relieving otherwise unresponsive chronic foot pain. Acupuncture on the feet could increase blood flow to the foot and lower leg. 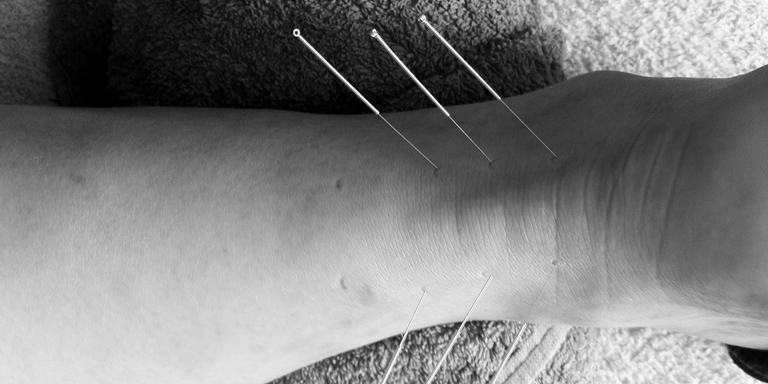 There have also been anecdotal reports of individual acupuncturists using different techniques to relieve pain associated with the ankle, heel, and ball of the foot. As with any other form of care, however, remember that not all patients will respond to all forms of treatment. Make sure to discuss the situation thoroughly with your podiatrist before undergoing treatment for foot pain. Foot pain is caused by a variety of conditions, most often improper foot function or poor posture. In fact, the most common cause of foot problems is a condition called abnormal pronation, where the foot does not strike and/or leave the ground as it is supposed to. Several other factors can causes (or lead to) foot pain. Footwear can worsen and, in some cases, produce foot problems. Shoes can increase pressure and stress, or create friction. Overuse and exercise-related problems can also cause foot pain, and this is the most common type of pain treated by acupuncture. Joint stiffness can also be treated with acupuncture. Achilles Rupture is treated with acupuncture. In the initial stages of treatment, acupuncture addresses the direct symptoms of the condition – reducing the swelling and inflammation in the foot and the pain that accompanies it. Acupuncture also addresses the indirect effects of the injury such as pain in the lower back due to the adjustment of our bones and muscles that occurs because of the change in our walking style. Achilles Tendonitis results from a shift in tension in the lower part of the calf which causes extra strain on the Achilles tendon and the muscles that brace it. As the muscle is in use continually, the excess burden causes the inflammation of the foot. Acupuncture is used to treat the calf muscles to ease the tension on the Achilles tendon and thus alleviate the pain and inflammation. Ankle Stress Fractures – A fracture caused by the overburdening of the ankles may lead to an aching foot as well as muscular guarding. Acupuncture, when applied to the affected foot, eases the circulation which ultimately helps to remove the chemical and by-products produced by the body to aid its recovery. If the hurt ankle is stabilized through a booting process so as to mend the fracture more effectively, there is a change in the body’s muscle structure that can cause additional pain; acupuncture can be used here as well. Bunions are treated with acupuncture to ease the pain and hold off a surgical solution wherever possible. Foot Stress Fractures may also be treated through acupuncture when there is no risk of displacing the bone at the point where the fracture has occurred. The affected area on its own will have a low level of blood circulation which may extend the recovery process. Acupuncture is used to ease the pain in the critical stage of recovery. Electro acupuncture is used to recreate bone structure in the long term recovery procedure. Metatarsalgia is a painful condition that occurs in the bones of the foot and its adjacent regions, called metatarsalgia, and is also treated with acupuncture. Metatarsalgia results from the constriction of core foot muscles; acupuncture corrects the structure of the foot and alleviates the strain on the muscles. Plantar Fasciitis is a type of foot pain that occurs lower extremity of the foot. It usually happens underneath the heel bone’s exterior but may be found at the side and rear too. Its main causes are straining and wear and tear of the heel bone’s soft tissue, and becomes sore and aching. You may experience a strong burning sensation during the initial phases of recovery, and this this may even become permanent. Recovery times for plantar fasciitis can be quite extensive and including acupuncture in the treatment regime reduces the tension on the lower back and associated muscles. This in turn make the plantar fascia more pliable and enhances its load carrying capability, whilst also addressing the symptoms such as pain, swollenness and inflammation. Sprained Ankle – Acupuncture is an effective treatment for a sprained ankle, be it a short-term injury or a long-term one. It deals with the aching and swollenness of the foot as well as the change in muscle structure that is an indirect consequence of this injury. If the injury persists – usually due to continual tension on the ligaments – acupuncture helps to evenly distribute the load on the muscles to avoid the repeated tearing. Turf toe is an injury that haunts athletes. It occurs in the large toes, when your soft tissue separates itself from the bone causing your toe to become swollen and inflamed – no amount of splinting or taping can assuage the pain or restore your ability to play. Acupuncture speeds up the recovery process by alleviating the symptoms of this condition. Dry needling is specifically used in treatment of verrucaes and warts on foot and ankle. Your podiatrist will discuss the procedure with you thoroughly and ensure it is the right treatment for you. Acupuncture and dry needling techniques are very similar. Dry needling uses solid filiform needles for treatment of muscle pain, sometimes also known as intramuscular stimulation. Proper dry needling of a myofascial trigger point will elicit a local twitch response (LTR), which is an involuntary spinal cord reflex in which the muscle fibres in the taut band of muscle contract. The LTR indicates the proper placement of the needle in a trigger point. Dry needling that elicits LTRs improves treatment outcomes, and may work by activating endogenous opioids. Inserting the needle can itself cause considerable pain, although when done by well-trained practitioners that is not a common occurrence. Needle penetration will cause micro-trauma and micro bleeding (localised inflammation) and hence the introduction of PDGF into the area will help promote healing. Dry needling can also be used for Verrucae treatment. Dry needling is a proceedure where the verruca / wart is punctured with a small needle to cause bleeding and stimulate the body’s immune system to resolve the problem.